Self Contained - Black Tie Toilets Ltd. 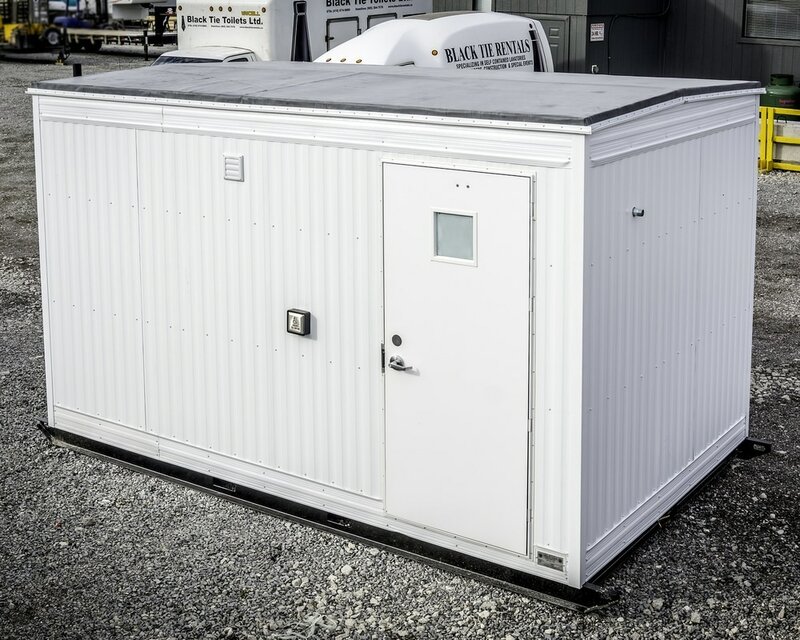 The Premium Double has an 8' x 10' footprint, weighs 4000 pounds and is skid mounted, with a 28" finished floor height. This unit requires a 40 amp dedicated, hardwired circuit. Circuits must be hooked up by a qualified electrician. Janitorial service is extra where available. 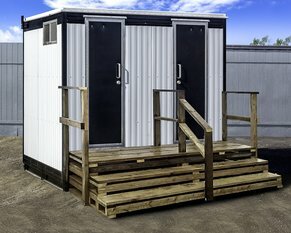 The Deluxe toilet has an 8' x 10' footprint for a more spacious washroom experience. It can be wheelchair accessible. ​This unit requires a 40 amp dedicated, hardwired circuit. Circuits must be hooked up by a qualified electrician. The Barrier Free toilet has an 8' x 14' footprint for a more spacious washroom experience. It is wheelchair accessible and has a 10" finished floor height. Larger water and waste tanks than the Deluxe units means that fewer service visits are required. The Barrier Free is compliant to 2015 ADA standards, which introduced wheel chair door operators and access buttons. Barrier Free Service is extra and determined by location. ​Steel and Aluminum constructed Trailer. Diamond Plate, Steel and Aluminum Construction with FRP interior walls and Textured Epoxy Exterior Subsurface. 1 x 750w, 2 x 1500w heaters. 2 Private, Insulated Cabins, 1 Male, 1 Female. Stainless Steel Sinks and Counter top.Self-closing faucets. -a Dedicated 20 amp 220v/240v Electrical Circuit for Winter Operation.